Ramatuelle Swim shorts Sabah was created based on the succes of style Borneo. Nice quality 4 way stretch fabric. fluor orange insert in side seam, dark blue piping around the round curved leg opening. 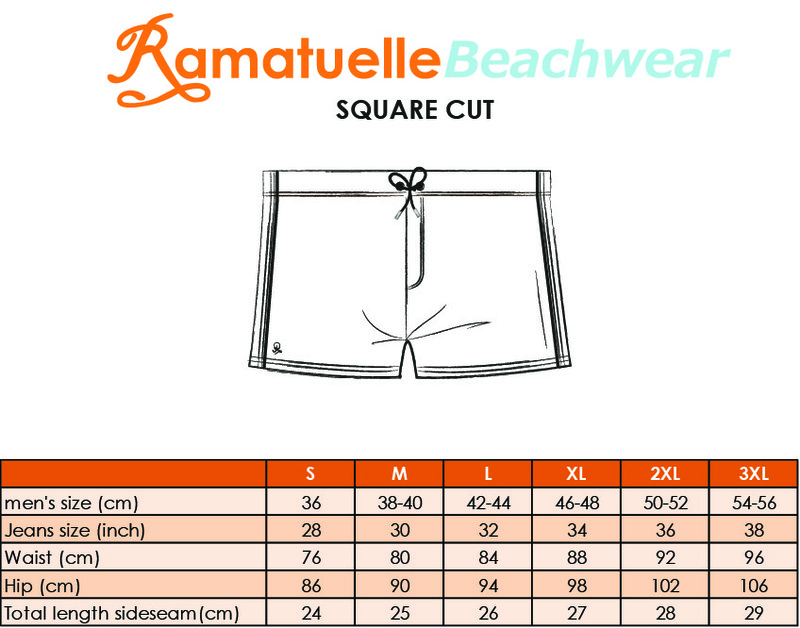 Read more..
Ramatuelle Swim shorts Sabah was created based on the succes of style Borneo. Daniel Graig as 007 in the movie "Casino Royale" has set this trend for the fitted swim shorts! First re-introduced by Grigio Perla, but soon followed by other fashion brands. This fitted 4 way stretch Swim Trunk is a must for every men's suitcase. Manly and sturdy. Trendy fit with shorts legs. Made out of a beautiful Italian stretch fabric. It has a fluor orange insert in the sideseam and contrast colour waistband and piping at the edge of the leg opening. Lining in the front for extra comfort. Allowed in all swimming pools, wellness hotels and other locations where the boxer style swim shorts is banned. Style Sabah has all the Ramatuelle details! You definitely will like to be spotted in this one! Available in 2 beautiful colour combinations. Wear it tight but not too tight! Look for the corresponding men's sizes and jeans sizes in our size chart.